This active attenuator works as a simple mixer. A signal from a 1 MHz oscillator is mixed with the received signal in a 1N914 diode. The 1000 ohm potentiometer adjusts the level of the local oscillator fed to the mixer diode. It is possible to get over 100 db attenuation using this device. This circuit is a variation of one first described in the November, 1992 issue of QST. That circuit was designed by PA0ZR. 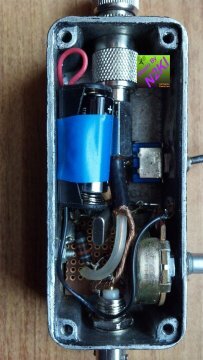 It used a L/C tuned 500 KHz oscillator. I used a 1 MHz crystal oscillator and it made construction even simpler than the original unit. 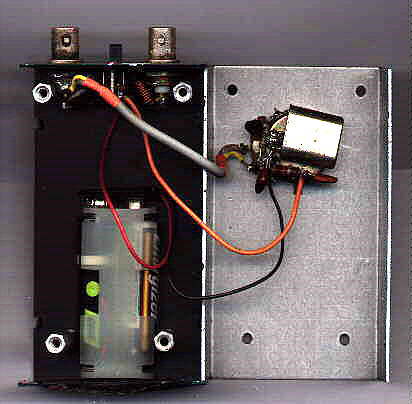 N2KI's version(4Mhz) built inside an RF proof enclosure. 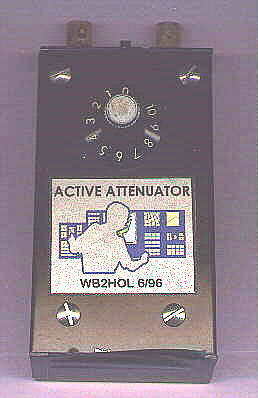 This attenuator is used by tuning the receiver 1 MHz above or below the frequency of the transmitter. By adjusting the oscillator level fed to the mixer diode, the signal output to the receiver will be attenuated. If you find that this circuit does not oscillate with your crystal you might need to add a small capacitor (anything from 5pf to 25pf) from the gate of the FET to ground. It may also help to reduce the 150pf capacitor connected from the drain to ground to 100pf. These two capacitors, along with the crystal, provide a 360 degree phase shift from the drain to the gate of the FET. The circuit pictured in the schematic below is a Pierce oscillator and relies upon the gate-to-source capacitance of the FET to form part of its phase shift network. If there is not sufficient stray capacitance to ground from the gate of the FET, you may need to add the additional capacitor. VE3EFY reported that his oscillator would not function below 4.5 volts. He used a 9 volt battery to power his unit. The battery should last a long time, he measured the current drain to be 1.8 mA. I built this unit "dead-bug" style. Most of the components were mounted and supported by their own leads on the back of the 1000 ohm potentiometer. The RF Choke connected between the output connector and ground was made by winding about 20 turns of 22 guage wire on a 1/8 inch drill bit. The coil was then slid off of the form and wired in place. If you want to use a commercially available coil, a value of 3.3uh should work just fine. That was the value specified in the original article. I mounted the 150pf capacitor, the 1N914 diode, and the RF Choke on the inside panel of the attenuator box between the two BNC connectors. I also mounted a slide switch between the BNC connectors so I could conserve the batteries when the unit was not being used on a hunt. Note: The MPF-102 Field Effect Transistor has an unusual pin-out compared to general purpose transistors. The GATE is not the lead in the center. The pin-out for the MOTOROLA MPF-102 is illustrated below. (The Radio-Shack MPF-102 I used had the same pin-out). 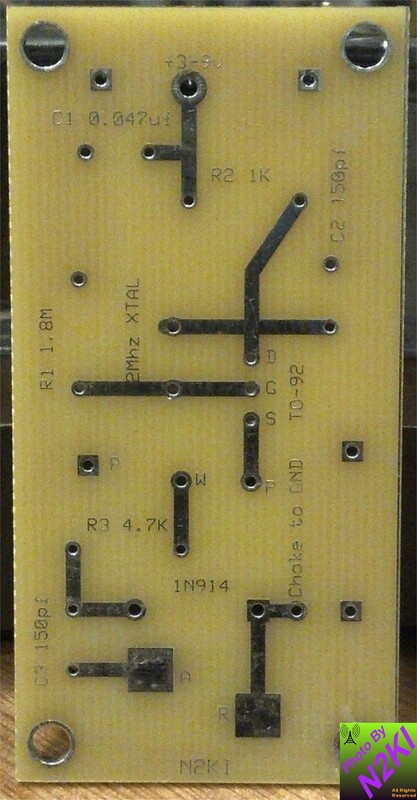 This is available for purchase ($23 + $3 shipping CONUS) as a PCB. It is a very neat simple project. It will come with a Mouser Parts List which you need to purchase separately from Mouser. Board is 1.25" x 2.5" and fits nicely in the 546-1590A RF proof box.